The concoction of two cooperating voices, a great sense of melody and the ability to make everything sound grand doesn't quite deliver what it could, but still makes you want to embrace it. 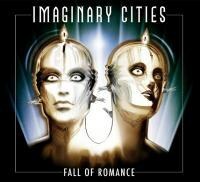 Fall of Romance, the second album by the Canadian Polaris-nominated indie pop act Imaginary Cities, begins with a ditty called “All the Time” (not counting the scene-setting but largely unimportant short intro). It’s a song that yearns to be big, both in scale and in the emotional impact it wants to achieve in its listeners. It has a gradual build from intimate to enormous, it has dramatic pianos and gospel choruses, soaring middle-eights and extended finales for the crowd to sing along with. It tries so desperately to be a Huge Moment that it’s almost a textbook example of one. But you know what – it achieves its goals. It’s the sort of opener that continues to echo in the listener’s mind even when the album’s moved on to other things; it sets the scene and opens the album in such a gorgeous way that it almost endangers to overshadow everything else before everything else has even had a chance to play. It’s an excellent song and if Imaginary Cities need a calling card, this is it. Right from its very beginning, Fall of Romance wants to sound like a classic album. “All the Time” is a minor anomaly on Fall of Romance because after it, Imaginary Cities largely strip down the grandeur, leaving the gospel choirs and other budget-breaking production choices behind. On one hand, it’s a little disappointing because it’s allowed us a taste of something lovely and now we want more, but on the other hand it helps to reveal who Imaginary Cities really are: a group that manages to take small elements and turn them into lush musical statements on their own, straddling somewhere between intimate and universal. Throughout the album songs start out as something small and suddenly turn into lush, towering anthems without ever really moving away from where they began. The title track is a great example. “Fall of Romance” is a gently strummed mid-tempo number that seems rather unassuming for a title track initially, but suddenly it hits a swooning melody so gorgeous in its chorus that the once bedroom-sized song suddenly touches something very universally beautiful and becomes something big and important. This occurs throughout the album and the moments never get any less exciting: “9 and 10” and “Bells of Cologne” (the only other big production number here, because with a title like that you just need some big bells to go along) in particular are excellent landmark moments for the band that make you believe you might have hit something special, simply because of their wonderful melodies and the way the band employ them. The secret weapon that Imaginary Cities accentuate their music with is their singers. There are bands with great vocalists and then there are bands that use their vocalists in a great way, and Imaginary Cities fall in the latter category. That isn’t to say that anything’s lacking in the voice department for their two mouthpieces: Marti Sarbit’s raspy, soulful tone stands out instantly in a very positive way and is a big part of the appeal in many songs, while Rusty Matyas’ softer, harmonious tone has a nice amount of charisma of its own whenever he steps in front of the microphone. The key thing is that the Sarbit and Matyas understand that their two very different voices can complement one another really well and they shamelessly take advantage of it all the time. The two singers trade the lead vocal position (although Sarbit spends most of the time in said place), underline each other’s strong moments with their own frequently and harmonise, back-and-forth and answer each other’s cues. It works incredibly well and often either helps accentuate the songs’ strengths or mask weaker moments where they might be. There aren’t many weaker moments on Fall of Romance but they’re confined to the final stretch of the album and act as a rather negative reflection to how strongly the album started. “A Way With Your Words” tries to be the personal moment of the album, stripping the elements down to an acoustic guitar and Matyas’ voice for the most part, but it ends up sounding like the least naturally flowing part of the album; a too conscious effort in sounding intimate. “Who’s Watching You” on the other hand is just good old poor judgment. It’s Imaginary Cities wanting to show that they can ROCK but they aren’t a band who really lends itself to that and the result is like a one-off live novelty cover, and the guest vocals from the Sheepdogs’ Ewan Currie are way too over-the-top to go with the rest of the Imaginary Cities vocal cast. The classily swaying “Water Under the Bridge” and the bombastic final bow “Still Waiting So Cold” fare better, but the former isn’t strong enough to really lift the album back to its legs and the overly short latter track finishes before it does. It’s an underwhelming, even if not a bad ending to an album that for most of its duration showcases something that could be rather special. The strengths outweigh the flaws however. Fall of Romance is special in the way that it makes you want to believe in the act: it’s not an extraordinary album, “merely” rather good, but Imaginary Cities themselves flash brilliance throughout in the way they create their melodies, make particular moments sound extraordinary and how they perform throughout the album. They make you want to fall in love with their music and quite often the songs themselves back the notion. All they need is a little more songs in the calibre of “All the Time”, even if not exact facsimiles of it, and they could make the step up from award nominees to winners. For now, Fall of Romance is a rather good way of spending time with them.